Tuesday, November 3, 1869: Ulysses S. Grant was elected as our 18th President by an electoral margin of 214 to 80 and carried 26 of the 34 states then in the Union. At the age of 46, he was the youngest President up to that date. Socioeconomic changes: Robert outlined events that would have an enormous socioeconomic impact on Grant’s Presidency. First, in 1859, in Oil Creek Valley near Titusville, Pennsylvania, 38-year old Edwin Drake drilled the first successful oil well. During the Civil War, kerosene refined from crude oil lit lamps by which Grant could read and draft military dispatches at night. After the Civil War, oil, not cotton, became King in the world of commerce. Second, the war brought on an unprecedented economic and technological boom to the North, in large part due to the existence of a legal system protective of private property and contracts. It was possible to obtain corporate charters and bank credit and when an enterprise failed, to obtain protection from creditors via bankruptcy. Third, the Puritan ethic and the moral authority of Church and State fell victim to a “Gilded Age” in which people took unethical shortcuts to obtain great wealth and influence. Before the war, you could say that politics was about ideas; after the war, it was about money. Grant is inaugurated: March 4, 1867, Grant and his Vice President, Schuyler Colfax (who served only one term), are sworn in by Chief Justice Salmon P. Chase. Grant himself wrote his Inaugural Address, at least half of which was devoted to fiscal issues: prompt payment of the National debt, faithful collection of revenue, and retrenchment in government expenditures. Sound familiar? He said he would approach Reconstruction “calmly, without prejudice, hate or sectional pride.” In foreign affairs, Grant promised to protect all U. S. citizens while abroad and to deal with all nations on the basis of “fairness and equality.” Then Grant, in the face of a hostile public mood, promised to assist the integration of native peoples and former slaves into American society and to support their ultimate full citizenship by ratification of the Fifteenth Amendment to the U. S. Constitution. Grant forms his cabinet: Grant’s Cabinet, unlike Lincoln’s, was not a “Team of Rivals.” In fact, Grant did not consult with the Republican leaders about his choices, which often were not fully qualified. In all Grant appointed 25 men to cabinet positions. Some turned out to be corrupt, two died in office and most turned out to be mediocre at best. Five of his nominees, however, were exceptional in their service, most notably Secretary of State Hamilton Fish (1869-77), Postmaster General, John Creswell (1869-74), Secretary of the Treasury George Boutwell (1869-73), his third Secretary of the Treasury, Benjamin Bristow (1874-76), and his fourth Secretary of War (3/8/1876-5/22/1876) and fifth Attorney General, Alphonso Taft (5/22/1876-3/4/1877). Fish, a personal friend of Julia Grant and a former New York Governor and Senator, developed the concept of international arbitration to settle the controversial Alabama claims, avoided war with Spain over Cuba, started the process toward Hawaiian statehood, brokered a peace conference between Spain and its former South American colonies, and settled the Liberian-Grebo war. Grant said Fish was the person he most trusted for political advice. [Note: Actually, Fish was Grant’s second Secretary of State because he had appointed Elihu Benjamin Washburne to that post on March 5, 1869. Grant's appointment was intended as a personal yet temporary means of honoring Washburne, who held office until relieved by Fish, on March 16, 1869.] Creswell, a Maryland Democrat turned Radical Republican and a former U. S. Representative and Senator, improved the postal system and became one of the most effective Postmaster Generals in U. S. history. Boutwell, former Governor of Massachusetts, was the architect of the 13th, 14th, and 15th Amendments to our Constitution and author of needed reforms in the Treasury Department. Taft put soldiers in charge of Indian trading posts, reducing corruption. The rest of the initial Cabinet consisted of Secretary of the Navy Adolph Borie (1869), a wealthy retired Philadelphia merchant who had prospered in the East Indian Trade and founded the Union League Club of Philadelphia; [Note: Borie was totally unsuited for the position and after only 4 1/2 months he returned to his business life. He remained a friend of Grant’s and accompanied Grant on his trip around the world.] Secretary of Interior Jacob D. Cox (1869-70), former Governor of Indiana and professor of law at the University of Cincinatti, had been a reasonably competent general in the Civil War, and was an enthusiastic reformer who was forced out in November 1870 because Grant did not back him against the spoils system; Attorney General Ebenezer Hoar (1869-70) of Massachusetts, former Associate Justice of the Massachusetts Supreme Court and a member of the Harvard College Board of Overseers was asked to resign in June 1870, ostensibly because of the tradition that no cabinet member could be from the same state as another; [Note: Your editor could not resist this footnote: When Harvard College instituted the “House” student residence system, Mr. Hoar’s name was rejected as a name for one of the Houses, because as a faculty member famously noted, “We don’t want a Hoar house at Harvard.”] and last, but not least, Secretary of War John Rawlins (1869), Grant’s wartime adjutant, chief advisor and close friend from Galena, Illinois, who died of tuberculosis after only seven months in office. Buying war bonds back with gold: The national debt, $64 million in 1860, had grown to $2.8 billion in 1869, most in the form of 6% bonds. There was $356 million in “greenbacks” in circulation, backed only by the “full faith and credit” of the U. S., which had driven gold coinage out of circulation. Finally there was $160 million in “fractional” paper currency, which had driven silver coinage out of circulation. On March 18,1869, Grant signed his first law: “An Act to Strengthen the Public Credit,” which pledged to pay all bondholders in gold at par and to redeem all paper money as soon as practicable. Until the Civil War, there had been no government-issued paper money. There were only gold coins and gold-backed certificates. There was about $100 million in gold in the entire U. S., of which $20 million was in circulation and $80 million held by the government. To strengthen the dollar, Treasury Secretary Boutwell, backed by Grant, sold gold from the Treasury each month and bought back high-interest Treasury bonds issued during the war. This reduced the deficit but deflated the currency. 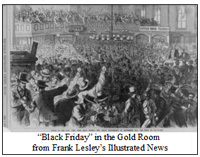 “Black Friday,” September 24, 1869: Grant breaks the Gold Ring’s effort to corner the gold market: Wall Street speculator, Jay Gould, and railroad magnate, Jim Fisk, tried to corner the gold market by bribing Grant’s brother-in-law Abel Corbin to influence Grant to appoint Gould’s associate, Daniel Butterfield as Assistant Treasurer. The “Gold Ring” also bribed Grant’s personal secretary, Horace Porter for advance information of the amount of gold to be sold by the government. At the start of 1869, gold cost $131 per ounce. By September 21, the Gold Ring owned $50 to $60 million in gold acquired at an average cost of $141 per ounce. The price of gold rose to a peak of $162 an ounce. Grant became aware of the unnatural increase in the price of gold and felt that the country was in danger. He took command and promptly ordered Boutwell to avoid a panic by selling $4 million in gold on September 4, 1977. T his reduced the price of gold overnight to $133 per ounce, breaking the Gold Ring. This was a watershed in the history of the American economy: For the first time in its history, the federal government had intervened massively to bring order to the marketplace. Foreign Policy: Three countries play a noticeable role in Grant’s foreign policy: Spain, the Dominican Republic and England. Grant won’t intervene in Cuban Revolt: In 1869, Spain was putting down an insurrection by Cuban rebels, who were supported by various groups in the U. S. who wanted to arm the rebels, overthrow the Spanish colonial government and even annex Cuba. Spain responded by intercepting and searching all American ships bound for Cuba. Grant put an end to the war talk by stating that the U. S. could not recognize the insurgents because they held no town, no established seat of government and no organization for collecting revenue. Failed effort to annex the Dominican Republic: Grant had been initially skeptical about annexing the Dominican Republic, but at the urging of Admiral Porter, who wanted a naval base at Samaná Bay, and Joseph W. Fabens, a New England businessman employed by the Dominican government, Grant became convinced of the plan's merit. He sent Orville Babcock, a wartime confidant, to consult with Buenaventura Báez, the Dominican president, who supported annexation. Babcock returned with a draft treaty for annexation in December 1869. Secretary of State Fish dismissed the idea, seeing the island as politically unstable, but out of loyalty joined Grant’s unsuccessful effort to win Congressional approval. Congress voted this initiative down for three reasons: (1) Grant had acted without prior Senate approval; (2) Acquiring the Dominican Republic would threaten the independence of Haiti, the only independent Black republic in the Western Hemisphere; and (3) Real estate speculation was occurring among American investors, local politicians and even some of Grant’s aides, which would seriously embarrass the United States. The “Alabama Claims:” CSS Alabama had been built in a British shipyard in 1862. During the next two years it circumnavigated the globe sinking more than 60 Union ships until it was finally sunk off Cherbourg, France by USS Kearsage. By the time Grant takes office, Great Britain is being pressed to make good the losses caused by CSS Alabama and other Confederate raiders. Private damage claims had been settled by insurance. Initially, Great Britain offered to pay $20 million for “actual losses” to American public property, but refused to reimburse indirect or consequential losses due to selling arms to the South. Thus the issue was: Direct Losses vs. Indirect Losses. 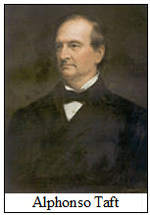 Charles Sumner (Mass. ), Chairman of the Senate Foreign Affairs Committee, had three goals: Make Great Britain (1) pay for the merchant fleet losses totaling $110 million; (2) admit that its involvement prolonged the war; and (3) admit that its involvement caused the U. S. debt to spiral to $2.5 billion. The first use of international arbitration to settle claims: The obstacles in the way of collecting these claims include: (1) the American Navy was largely demobilized following the end of the war; (2) The British Navy, based on steel-clad vessels driven by steam far outclassed the American Navy; (3) U. S. Government bonds were nosediving in value; (4) American industry was largely financed by British money; (5) Where would American business go if British banks stopped lending money, since American banks had almost nothing left to lend? ; (6) War with Great Britain would exacerbate the U. S. debt; and lastly, threatening war with Great Britain made U. S. financial leaders nervous. Grant’s solution, due largely to his Secretary of State, is the Treaty of Washington, which commits both sides to arbitration. One U. S. diplomat and one English diplomat would agree on a panel of arbitrators who would recommend a “declaration” (not a “decision”) on the issue of indirect claims. The panel promptly declares it has no power to consider indirect claims. The result was the award of $15.5 million and the establishment of what is still one of the most important precedents in International Law: settling disputes between great nations by international arbitration rather than the threat or use of force. Domestic Policy – Reforming Native American policies: Grant respected Native Americans and was aware that greed, corruption, brutality and the saying that “the only good Indian was a dead Indian” infected policy. Grant was determined to develop programs aimed at full citizenship and accommodation rather than genocide. To this end, Grant relied on Secretary of Interior Jacob Cox and Commissioner of Indian Affairs Ely S. Parker (the first Native American appointed to that post), to carry out his policy. 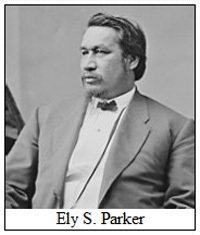 Parker, (born Hasanoanda and later known as Donehogawa) was a Seneca attorney, engineer, and tribal diplomat. During the war, he had served as adjutant to Grant, written down the official copy of the Confederate surrender terms at Appomattox, rose to the rank of Brevet Brigadier General, one of only two Native Americans to earn a general's rank during the war (the other being Stand Watie, who fought for the Confederacy) and was Grant’s “eyes and ears” to keep tabs on frontier conditions after the war. A major task for Grant’s policy was to get Congress to approve a $4 million appropriation to fund administration of Indian affairs. Due to graft and bureaucratic overhead, only 25% of the money appropriated ever reached the tribes. Grant adopted the recommendation of a group of philanthropists to appoint a commission to supervise the spending of Federal funds. Grant never wavered in his efforts to reform the Bureau of Indian Affairs. Blocked by Congressional inaction, he issued an Executive Order authorizing the Commissioner of Indian Affairs to inspect and report on all aspects of Indian policy. Despite setbacks and public criticism, Grant persevered, believing deeply in human equality for both Native Americans and former slaves and changed the way Americans thought about Native Americans and helped save them from extinction. Reconstruction: By the time Grant moved into the White House, Reconstruction had failed, but Grant thought that there was still a chance to make it work. The Fourteenth Amendment, ratified July 9, 1868, granted citizenship to “all persons born or naturalized in the United States,” which included former slaves recently freed. The Fifteenth Amendment, ratified February 3, 1870, declared that the “right of citizens of the United States to vote shall not be denied or abridged by the United States or by any state on account of race, color, or previous condition of servitude.” Ratification was celebrated by a 100-gun salute and a torchlight parade down Pennsylvania Avenue. Speaking from the front steps of the White House, Grant said the new right would be used wisely and that the Fifteenth Amendment was the most important event in the nation’s history. 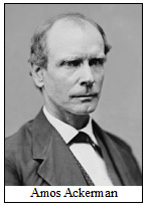 To protect the rights of the freedmen, Grant appointed a new Attorney General, Amos Ackerman (1821-80) [Note: Ackerman, born in New Hampshire, had moved south and served in the Confederate army and therefore was Grant’s first Southern appointment. Although he served only 18 months, he took office as head of the newly formed Justice Department, which had been created to handle all of the federal government's litigation (previously, each department hired its own lawyers on a case-by-case basis), and he began the department's first investigative unit, which later became the Federal Bureau of Investigation. His term ended when he was asked to resign because of his opposition to land grants to railroad speculators, squeaky clean interpretation of the new Civil Service Act and his energetic anti-Klan efforts.] and Congress passed three Enforcement Acts making it a Federal offense to attempt to deprive someone of his political rights. [Note: The Supreme Court later struck down these Acts as invasive of states’ rights in U. S. v. Cruikshank, 92 US 542 (1875), holding that the Due Process Clause and the Equal Protection Clause of the Fourteenth Amendment applied only to state action, not to actions by individual citizens. It said that the plaintiffs had to rely on state courts for protection.] Congress also passed a law establishing a permanent U. S. Department of Justice (authorizing the Attorney General to supervise the U.S. attorneys and Federal Marshals) and the Office of the Solicitor General, naming Benjamin Bristow as the first Solicitor General. When the 42nd Congress convened on March 4, 1871, the South boiled with violence, much directed at former Union soldiers. 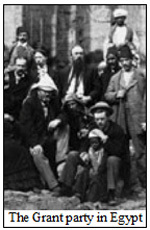 At Grant’s request, on April 20, 1871, Congress passed the “Klu Klux Klan Act,” making it a federal offense to conspire to prevent persons from holding office, voting or enjoying the equal protection of law, suspending the write of habeas corpus and empowering the President to use the army to enforce the law. This law represented an enormous peacetime extension of federal authority–for the first time, private acts of violence became federal crimes. Grant urged voluntary compliance and asked the South to help suppress the Klan. Federal grand juries returned over 3,000 indictments in 1871 alone, and, with the assistance of former Klan members, 600 were convicted. Most paid fines or got short jail sentences. Sixty-five defendants received five year sentences. By 1872, Grant’s determined use of full legal and military measures had broken the Klan. By then, however, most Northerners were losing interest in Reconstruction. Proof of this changing opinion was enactment of the “Amnesty Act of 1872,” which allowed all but 500 former Confederates to vote again. The effects of the Amnesty Acts were almost immediate. By 1876, Democrats had regained control of all but three states in the South. Black Republicans clung to power in South Carolina, Louisiana, and Florida, but only with the help of federal troops. Panic of 1873: Grant was re-elected with 56% of the popular vote and the Republicans retained control of both houses. On September 17, 1873, as Grant supped with Jay Cooke (the banker who had helped Lincoln finance the Civil War) the Northern Pacific Railroad ran out of money. The result was the Panic of 1873 – businesses failed, people lost their jobs and many farmers failed. Congress reacted in April 1874 by passing the “Inflation Bill,” legalizing the reissue of $26 million in greenbacks and authorizing the Treasury to issue $18 million new greenbacks, bringing total circulation to $400 million. Grant vetoed the bill because (1) it would wreck the credit of the American government; (2) inflation would shoot into double figures; (3) recession would become depression; and (4) industrialization would stop. Grant felt he was using moral courage by doing the hard thing that was right rather than the easy thing that was wrong. On January 14, 1875, Grant signed the “Resumption Act,” restoring specie payment and discontinuing printing greenbacks which had deflated the dollar. The adoption of a stable currency began the first steps toward recovery. [Note: In 1874, there was no mechanism to apply the brakes when the economy was overheating.] Without a standard of value (gold), Congress was free to expand the money supply unchecked. Republicans lose the House in 1874: Congress will spend the rest of Grant’s second term embroiled in Reconstruction controversies. “Whiskey Ring” fraudulently lowers its taxes by bribing the internal revenue superintendent: Grant’s new Treasury Secretary, Benjamin Bristow, working without the knowledge of the President or the Attorney General, broke the tightly connected and politically powerful ring in 1875 using secret agents from outside the Treasury department to conduct a series of raids across the country on May 10, 1875. U ltimately, over 350 individuals were indicted, of whom 110 were convicted and over $3 million in taxes was recovered. Custer and the Battle of Little Big Horn: Although the Sioux gained nothing from this victory, it dealt a serious blow to Grant’s popularity and Grant’s peace policy was faltering. However, no president could have done more and none had done as much. July 4, 1876 and the Election of 1876: The Centennial Exposition in Philadelphia, Pennsylvania marks the 100th anniversary of the Declaration of Independence. That fall, the election depended upon the votes in three states: Florida, Louisiana and South Carolina. Grant steps in to appoint a special arbitration commission, which votes 8 -7 on party lines for Rutherford B. Hayes. The price would be the withdrawal of Federal troops from the Southern states, ensuring 100 years of Jim Crow, lynching, and white control. Grant’s Trip Around the World, May 17, 1877 - September 20, 1879: When Ulysses S. Grant left the White House in 1877, he certainly needed a vacation. His reputation had been severely damaged by corruption in his administration and his party. And the difficulties of trying to reunite North and South proved tiring and unrewarding. But when Grant left with his family for England on May 17, 1877 for a world tour, he had more than rest and relaxation in mind. Grant hoped that if people in other countries showed their admiration for him, Americans would forget the scandals of his presidency. If they did, he might win the Republican nomination - and recapture the presidency - in 1880. But even if Grant expected that foreigners would treat him with honor, the reception he received probably surprised him. The Grants' ship arrived in Liverpool, England on May 28, 1877. Huge crowds turned out to welcome Grant, who was honored not as a former president, but as the military hero who saved America from falling apart. British leaders, from the Prince of Wales to Queen Victoria herself, lined up to host the Grants at lavish dinners and receptions. The Queen was irritated because the Grants brought their son Jesse along to meet her. Still, she treated them cordially, although she later referred to 19 - year - old Jesse as a “very ill-mannered young Yankee.” All across Western Europe, from Belgium to Switzerland and Germany, the Grants were treated like royalty. Perhaps the most incredible display of affection came in Newcastle, England, which the Grants visited on September 22, 1877. An estimated 100,000 people, most of them factory workers, turned out to honor Grant with a parade and hear him speak. The Grants kept moving. In Egypt, they visited Alexandria and Cairo, and steamed up the Nile. They toured Jerusalem and saw the Western world's holiest sites. Then they moved on, to Greece and Rome, Russia, Austria, and Germany. After briefly returning to Britain, the Grants set out for Asia. They toured Burma, Singapore, and Vietnam. In Siam, the Grants met King Chulalongkorn, who at 25 had already been king for 10 years. In China, Grant declined to ask for an interview with the Guangxu Emperor, a child of seven, but did speak with the head of government, Prince Gong, and Li Hongzhang, a leading general. They discussed China's dispute with Japan over the Ryukyu Islands, and Grant agreed to help bring the two sides to agreement. After crossing over to Japan and meeting Emperor Mutsuhito and Empress Haruko (Grant was said to be the first person in the world to shake the Emperor's hand), Grant convinced China to accept the Japanese annexation of the islands, and the two nations avoided war. Americans must have read of Grant’s adventures with fascination. At the time, Asia was largely unfamiliar territory to most Americans - Grant included. America did not yet enjoy close political relations with many Asian nations. By the time the Grants returned to America, on December 16, 1879, the former president's image had improved. When he disembarked at San Francisco, with the St. Bernard, named Ponto, he’d acquired in Switzerland, he was met by an enormous crowd. But as Grant continued his tour through the cities and towns of America, support for him diminished. The world tour had been thrilling, but it would not be enough to help Grant regain the presidency. When the ballots were counted at the Republican convention of 1880, James A. Garfield was the winner of the party's nomination. Grant’s Historical Reputation has Risen, Fallen and Risen: Throughout the 20th century, historians ranked his presidency near the bottom. In the 21st century, his military reputation is strong, while experts rank his presidential achievements well below average. The same qualities that made Grant a success as a general carried over to his political life to make him, if not a successful president, then certainly an admirable one. The common thread is strength of character—an indomitable will that never flagged in the face of adversity. As commanding general in the Civil War, he had defeated secession and destroyed slavery, secession's cause. As President during Reconstruction he had guided the South back into the Union. By the end of his public life the Union was more secure than at any previous time in the history of the nation. And no one had done more to produce the result than he. Robert received a well-earned round of applause, followed by a Q-and-A session. Note: Don’t miss “By Land and Sea: Florida in the American Civil War” at the Palm Beach County History Museum, 300 North Dixie Highway, West Palm Beach (it runs through July 2, 2016).